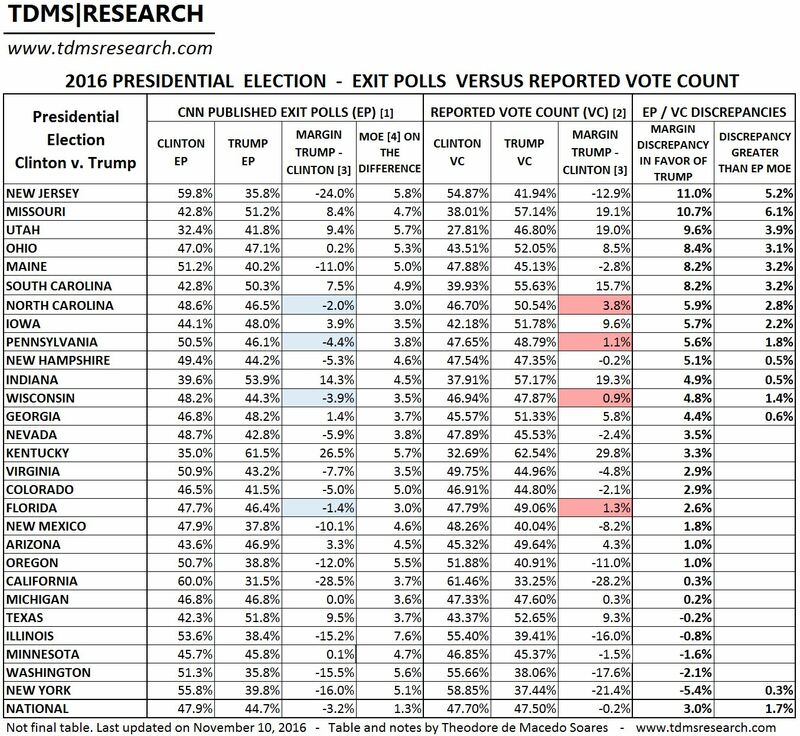 The unadjusted 2016 exit polls show large discrepancies to the recorded vote in battleground states. This analysis compares the Ohio reported vote, the Edison Research unadjusted exit poll, the CNN adjusted poll (matched to the recorded vote) and the True Vote Model. Clinton led the average of nine pre-election national polls by 45.8-43.3%. Trump led Independents by 43.6-33.8%. Trump won the OH reported vote by 52.0-43.5%. But according to the CNN published exit poll, he won by just 47.1-47.0%. Does the discrepancy indicate that votes were rigged for Trump? Not at all, the evidence indicates that he won OH as reported. The unadjusted exit poll discrepancies are largely due to the implausible difference between Trump and Clinton’s share of Independents. To match the CNN published exit poll, Clinton must have won the Independent vote by an implausible 50-34%. 1: CNN exit poll. Implausible. 2: CNN exit poll. Implausible. 3: OH reported vote. Plausible. 4: OH True Vote Model. Plausible. Close match to the reported vote. What in your opinion is the percentage of votes that Dr. Stein earned on election day? Is it less than 1 percent as currently publicized? Or is there a range that is more likely in your opinion? I would estimate at least 5%. Hi Richard, Beautiful work. Would you be interested in supporting my class action against the RNC, et al. for the Nov 8th election fraud? I’ll also be relying on Greg Palast’s work showing the Crosscheck program knocked 1.1M minority voters off the rolls beforehand. What about the nearly 3 million illegal aliens who voted thanks to Obama? @Richard Charnin Why would an undocumented person vote? The last thing in the world a person who is not here legally would do would be to walk into a government sanctioned facility and commit fraud. It’s not worth the risk to cast one vote. You might have well have suggested that actual aliens from space are voting in our election; it’s at least as verified as your claim. Well it looks like one or both of the 2 major parties stole the Green Party votes and quite possibly the Libertarian votes to keep 3rd parties under the 5% mark that would have given them Federal funding and a better chance of recognition in 2020. The 2 major parties don’t want the competition plus its easier to control the outcome of the rigged elections. How can the people stop this monstrosity?? Reblogged this on Oregon False Flags Exposed.